Kakapo conservation – grasping at straws or crowdfunding conservation icon? The ever-increasing human population is pushing more and more species towards the brink of extinction. With over 600 endangered species, New Zealand is struggling to prioritise ever decreasing funds from a stretched Department of Conservation (Kirk, 2015). So, how are these tough decisions reached? Many empirical methods have been used to assess whether a species is ‘worth’ conservation intervention. Some are simple and straightforward equations, while some are very convoluted involving many different variables. A novel term coming to the forefront as we realise that not all species can be saved, is triage. Triage in this sense, is the process of prioritising conservation activities; allocating scant resources to achieve maximum conservation returns (Bottrill et al., 2008). Kakapo are an example of a species that may be designated a ‘lost cause’ if the triage approach were implemented by DOC. This nocturnal, flightless, extremely vulnerable bird was decimated by the combined efforts of human and invasive mammal predation, helped along by habitat loss. Now listed as ‘extinct in the wild’ by the IUCN red list, the only known kakapo are managed on pest free islands (Clout & Merton, 1998). The history of kakapo is a sad and altogether too familiar one. Once, you could supposedly, “shake six from a single tutu bush” (Langton, 2000, p. 250). But following the arrival of humans and our mammalian co-invaders, the entire species was reduced to 51 individuals by 1995 (Ratley, 2014; Harrison & Moorhouse, n.d.). Helped along by modern technology and intensive management, the population has gradually climbed to just under 160 (News and updates from the Kākāpō Recovery Team, 2016). Kakapo have a limited role in ecosystem functioning mainly through vegetation, root and rhizome removal as well as contributing to seed dispersal through frugivory – mostly of rimu fruit (Clout & Hay, 1989; Gibbs, 2007; Atkinson & Merton, 2006). I have evaluated the general considerations when discussing the value of conserving a critically endangered species using kakapo as an example. Flagship species are enigmatic or charismatic species which act as an ambassador for conservation in a given area or globally. Additional funds raised in the protection of this species may be allocated to other causes or conservation action, thus flagship species are often crucial for conservation (Simberloff, 1998; Bennett, Maloney, & Possingham, 2015). kakapo are what may be termed ‘high risk attention grabbers’ – they are a high profile species at great risk of extinction without immediate intervention. In order for species such as this to maintain public sympathy, results of conservation need to be rapid and tangible; for example, the positive response of kakapo to supplementary feeding in 1990-1991 which resulted in a significant population increase (Towns & Williams, 1993). Thus, it has been relatively straightforward to encourage funding from the general public and large corporations for Kakapo. The run-off effects of kakapo recovery include pest eradication and habitat restoration which benefits other species (Axed fund raises questions, 2012). Fortunately for kakapo, they are also charming and cheeky. A prime example of this is the ambassador for kakapo, Sirocco. Sirocco travels the country raising awareness and funds for the conservation of his species. Due to intensive hand rearing (he was the first male to be hand raised and they had not yet perfected avoiding human imprinting), it was realised that Sirocco had imprinted on humans and would not be a successful breeding bird but could make an excellent ‘public face’ for kakapo conservation (Sirocco, n.d.). After a botched attempt at mating with zoologist Mark Carwardine’s head was filmed and put on youtube, Sirocco shot to international fame. In 2011, two years after the infamous incident, 2000 people pre-ordered tickets to see Sirocco in Zealandia, raising funds for the sanctuary (Sirocco, n.d.). Simply searching for ‘kakapo crowdfunding’ in Google brings up several campaigns raising funds for kakapo conservation. One example of this successfully raised the full goal of $45,400 which will go towards the kakapo 125 project which is described in the ‘Genetic Considerations’ section (Iorns, et al., 2016). An endemic species is found nowhere else on earth, kakapo are an example of such a species. They are described as ‘phylogenetically unique’ as they have been evolving in isolation from other related species for millions of years. Much value is placed upon those species which are rare or unique, and an increasing number of management programs prioritise these species. An example of this is the EDGE programme, launched by the Zoological Society of London, which stands for ‘Evolutionarily Distinct and Globally Endangered’ and prioritises conservation efforts on those species which are phylogenetically distinct as well as rare. As the only member of the subfamily Strigopinae, and being one of the world’s most endangered birds, kakapo rate very highly in the EDGE ranking system (EDGE : Bird Species Information – Kakapo, (n.d.). The concept of the inherent value of nature can be traced back to Soulé who states that: ‘biotic diversity has intrinsic value irrespective of its instrumental or utilitarian value’ (Soulé, 1985). Thus in themselves, kakapo, evolving in seclusion for millennia, have value. Humans are also sentimental creatures whose dualism of being a part of nature, yet remaining distinct from it has resulted in feelings of guardianship towards nature (Bromley, 2013). The Māori term for this is kaitiakitanga which, through the partnership with Ngai Tahu and honoring Treaty of Waitangi responsibilities, is a core component of the The Conservation Act 1987 (Kawharu, 2000; Treaty of Waitangi Responsibilities, n.d.). Described as a unique, amusing, and beautiful, kakapo are not a difficult species to love either. In the words of Douglas Adams: “The kakapo is a bird out of time. If you look one in its large, round, greeny-brown face, it has a look of serenely innocent incomprehension that makes you want to hug it and tell it that everything will be alright” (Adams & Carwardine, 2009). All known kakapo are heavily monitored on three offshore islands: Whenua Hou (Codfish Island), Anchor Island and Hauturu o Toi (Little Barrier Island). Listed in Table 1. are tasks the Kakapo Recovery team, made up of ten full-time Department of Conservation staff, perform in order to help boost the kakapo population. Food supplied to the ‘wild’ kakapo must be expertly adjusted: too little food and the kakapo may not breed at all or the female may lay few eggs, too much food and the females may produce too many male offspring. All pests (mostly kiore or Pacific rat) exterminated from the three islands which kakapo have been removed to. Anchor island is still prone to stoat invasions as it is within swimming distance of the mainland, so maintenance must be ongoing on this island. It was found that females who have mated more than once in a breeding cycle produce more fertile eggs than those that only mate once. The team remove sperm from selected males (often those with rare genes or who haven’t had many offspring) and using it to simulate a mating event with a female who has already been mated with in that breeding cycle. 41% of the current kakapo population have been hand raised. This is an intensive process as the egg requires constant, specialised care. Chicks are returned to the wild at 4 months and have a survival rate of 91%. Each kakapo has a smart transmitter attached to it, sending out data about the health of the bird as well as nesting and mating information. If a nest is established, the kakapo team have rostered ‘night-shifts’ where they guard the eggs or chicks for several months while the female is feeding. Full check-up of the bird is performed including: weighing, taking blood samples, checking the transmitter and removing parasites. This occurs yearly for adult birds, daily for nestlings and every 2-6 weeks for chicks under two years old. Table 1. Shows the methods through which the Kakapo Recovery Team is attempting to grow the current kakapo population. Adapted from “In the wild” (n.d.). Kakapo conservation carries a hefty price tag. While finding exact figures of funds raised and tracing their use in kakapo conservation is difficult, in 1990 DOC entered into a partnership with Rio Tinto, New Zealand Aluminium Smelters Ltd and Forest & Bird. This partnership had raised $3.5 million as of 2010 before Rio Tinto dropped out in 2012 (Guyton & Deal, 2010; Axed fund raises questions, 2012). Due to the very ‘hands on’ approach of their recovery detailed above, every cent of that $3.5 million is vital. Much of the rest of the Kakapo Recovery Team’s funding comes from companies such as Meridian Energy, who have recently agreed to a three year partnership assisting the kakapo recovery fund (A Plan for the Future, n.d.). But three years in the grand scheme of kakapo conservation is not long at all – the long term goal of kakapo conservation is “To restore the mauri (life-force) of kākāpō by having at least 150 adult females” (A Plan for the Future, n.d.). With the current population of less than 160 individuals in total, and incredibly slow and irregular breeding cycles, this could take several decades. As described in the ‘Role as Flagship Species’ section above, crowdfunding is a more recent method for the Kakapo Recovery Group to raise funds for conservation. As is their ‘Adopt a Kakapo’ concept where members of the public can pay $100-500 to ‘adopt’ one of 13 birds currently available on their website (http://kakaporecovery.org.nz/adopt-a-kakapo/). A species can be described as ‘genetically depauperate’ if it has low genetic diversity compromising its longevity as a species. Genetic diversity in the kakapo population is extremely low after experiencing such a severe bottleneck when the population was reduced to only 51 individuals. All but one of the population’s founders (Richard Henry: the only male from the Fiordland population to produce offspring) came from the same population. Described as a ‘ticking time bomb’, inbreeding depression is the increased likelihood of extinction and results when there is a sustained level of inbreeding due to low population numbers for several generations (Jamieson, Wallis, & Briskie, 2006). Further loss of genetic diversity is being actively managed by DOC through preventing closely related individuals from mating and via a programme termed the kakapo 125 project which aims to sequence the genome of all known living kakapo (Projects – Genome Sequencing – Kakapo, n.d.). Kuia (pictured below), the only daughter of Richard Henry, will be crucial for maintaining diversity in the population. This is because all other kakapo are from a Stuart Island population which had already been isolated prior to human settlement of New Zealand (White et al., 2015a). Despite the efforts already taken, the effects of inbreeding depression are already visible in the current kakapo population and are listed in Table 2. Kuia, Richard Henry’s daughter, nesting (Thompson, 2016). 40% of all eggs laid since 1985 have been infertile (average parrot infertility is around 10-15%) (Clout & Merton, 1998; Artificial insemination, n.d.). There are currently fears that exudative cloacitis, a bacterial disease which results in infected birds being unable to breed, may become a serious issue in kakapo populations due to reduced fitness (evolutionary longevity) through low genetic diversity (White, et al., 2015b). Table 2. Showing the symptoms of inbreeding depression, their effects on populations (or species) and the evidence of this observed in the kakapo population. It is well documented that humans value rarity, but has conservation reached the stage where we no longer have the luxury of conserving species just because we find them charming and charismatic? Or are species such as kakapo still contributing to conservation funding enough as flagship species that it outweighs their lack of ecosystem functioning? Although often seen as pernicious and fatalistic, the triage approach to conservation has its groundings in prioritisation of increasingly limited resources (Towns & Williams, 1993). With budget cuts to the Department of Conservation occurring almost yearly, we need to have systems in place which will mean that these species not only have funding now, but ongoing – and a department to ensure habitat enrichment & pest control persists. I am of the opinion that species such as the kakapo deserve to be protected purely for their own sake. They represent millennia of evolution and their naivety and fragility despite this are endearing factors alone. Perhaps none could sum this up as well as the legendary Don Merton (pictured below) who has been instrumental in their rescue: “They are our national monuments. They are our Tower of London, our Arc de Triomphe, our pyramids. We don’t have this ancient architecture that we can be proud of and swoon over in wonder but what we do have is something that is far, far older. No-one else has kiwi, no-one else has kakapo. They have been around for millions of years, if not thousands of millions of years. And once they are gone, they are gone forever. And it’s up to us to make sure they never die out.” Sentimental reasons aside, kakapo populations have increased by more than 200% since the 51 recorded in 1995 (Plumb, 2016). If this trajectory is maintained, funds will continue to be raised and the future of kakapo will be more secure. Chris Smuts-Kennedy, John Cheyne and Don Merton with Mandy the dog. 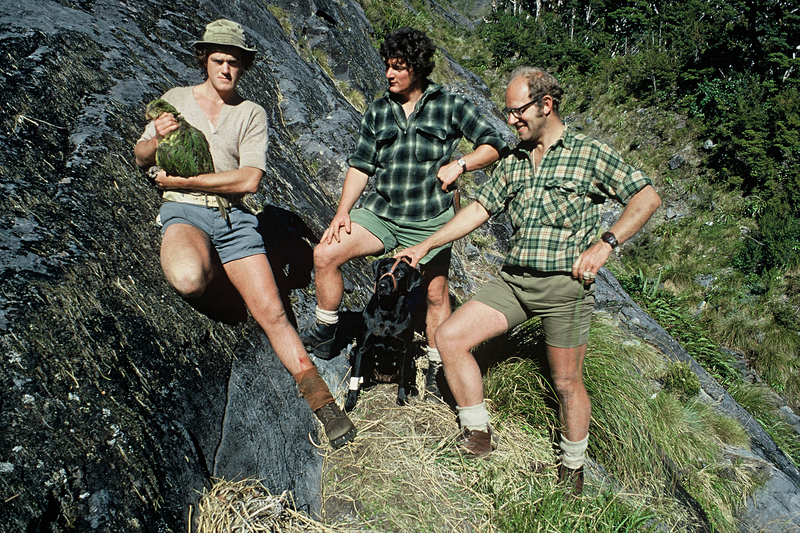 The kakapo is Jill, the second male captured in the Esperance Valley, Fiordland, 1974 (Department of Conservation, 1974). Adams, D., & Carwardine, M. (2009). Last chance to see. London: Arrow Books. Atkinson, I. A. E., Merton, D.V. (2006). Habitat and diet of kakapo (Strigops habroptilis) in the Esperance Valley, Fiordland, New Zealand. Notornis. 53;37–54. Bennett, J. R., Maloney, R., & Possingham, H. P. (2015). Biodiversity gains from efficient use of private sponsorship for flagship species conservation. Proceedings of the Royal Society of London B: Biological Sciences, 282(1805), 20142693. Bottrill, M. C., Joseph, L. N., Carwardine, J., Bode, M., Cook, C., Game, E. T., … & Pressey, R. L. (2008). Is conservation triage just smart decision making?. Trends in Ecology & Evolution, 23(12), 649-654. Clout, M. N., & Hay, J. R. (1989). The importance of birds as browsers, pollinators and seed dispersers in New Zealand forests. New Zealand journal of ecology, 27-33. Clout, M. N., & Merton, D. V. (1998). Saving the Kakapo: the conservation of the world’s most peculiar parrot. Bird Conservation International, 8(03), 281-296. Gibbs, G. (2007). Ghosts of Gondwana; The history of life in New Zealand. Nelson: Craig Potton Publishing. Jamieson, I. G., Wallis, G. P., & Briskie, J. V. (2006). Inbreeding and endangered species management: is New Zealand out of step with the rest of the world?. Conservation Biology, 20(1), 38-47. Kawharu, M. (2000). Kaitiakitanga: a Maori anthropological perspective of the Maori socio-environmental ethic of resource management. The Journal of the Polynesian Society, 109(4), 349-370. Langton, G. (2000). Mr Explorer Douglas John Pascoe’s New Zealand Classic [Revised by Langton, G.]. Christchurch, New Zealand: Canterbury University Press, p. 250. Simberloff, D. (1998). Flagships, umbrellas, and keystones: is single-species management passé in the landscape era?. Biological conservation, 83(3), 247-257. Towns, D. R., & Williams, M. (1993). Single species conservation in New Zealand: towards a redefined conceptual approach. Journal of the Royal Society of New Zealand, 23(2), 61-78. White, D. J., Hall, R. J., Jakob-Hoff, R., Wang, J., Jackson, B., & Tompkins, D. M. (2015a). Exudative cloacitis in the kakapo (Strigops habroptilus) potentially linked to Escherichia coli infection. New Zealand veterinary journal, 63(3), 167-170. White, K. L., Eason, D. K., Jamieson, I. G., & Robertson, B. C. (2015b). 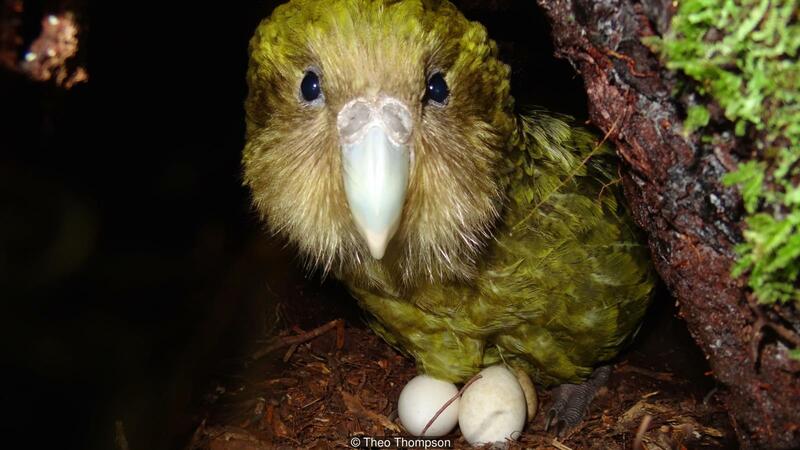 Evidence of inbreeding depression in the critically endangered parrot, the kakapo. Animal Conservation, 18(4), 341-347.